When my hosts Karl Houlihan and Sherri Kelly woke up this morning, I got outof my bed, folded that thing back into a couch and had a shower before joining them at the breakfast table. Karl seems to love a good morning breakfast. He made eggs with bacon and beans, these kinds of meals are just delicious. We arranged today for some around-town sight-seeing. Karl and Sherri drove me up the hills north of the downtown area, where I got this great view overlooking the harbour and The Narrows. This place was called the National Historic Site Signal Hill. Signal hill is a massive, grass-covered chunk of rock with views that are dramatic enough to realize I should be happy that we drove up here by car and we weren't walking. Known originally as The Lookout, Signal Hill took it's present name in the middle of the eighteenth century, when it became common practice for flags to be lifted here to notify the merchants of the arrival of a vessel � giving them a couple of hours to prepare docking facilities and supplies. The hill was also an obvious line of defence for the garrison of St John's. The antiquated guns close by, the Queen's Battery, peer over the entrance to the harbour directly above Chain Rock. And this Chain Rock was again used to anchor a chain that was dragged across The Narrows in times of danger. "During the World War II these chains were up all the times, to prevent Nazi-German U-Boots to secretly enter the harbour," Karl explained to me. On the other side we saw the remains of the centuries-old Fort Amherst. One little road connects the few houses and the lighthouse to the rest of town. Right on top of Signal Hill is the Cabot Tower built to commemorate John Cabot's landing of 1497. We went inside to escape from the icy cold harsh wind and enjoyed the display features about the history of this hill. It was Guglielmo Marconi, who confirmed the reception of the first transatlantic radio signal here in December 1901. It was interesting to see a short documentary about this undervalued man. In the souvenir shop on the first floor or this tower I discovered not only how many times you can print the name St John's on really any possible material, but also that almost everybody in St John's knows each other. One guy that works there recognized Sherri from the movie theatre and suddenly my hosts were discussing the digital effects in The Matrix Reloaded. It was here at the souvenir shop where Karl bought me a small St John's pin as a souvenir and we all had a giant round lollipop for on the road. I fooled Sherri very well by telling her that "in Europe we call these huge lollipops Practice Balls". She asked if they would be sold to children too, then. "Of course, then we just call them Big Ones." It was a a 30-minute drive to our next destination: the Cape Spear National Historic Site. This was just a place I HAD to visit, no matter what. A winding walkway encircles the cape and brought us to this sign. I can proudly say I made it all the way to the most easterly point of North America. There is no other part of this continent that is now so close to Europe. That was pretty cool. I waved but I could not see anybody waving back on the other side, a farming Irish man or something. It was on the route to Cape Spears I also got a great view on a stranded iceberg. These big lumps of snow and ice broke lose from North Pole's ice cover and float around until they melt or go aground like here. It is still weird to imagine that one-eighth of the iceberg is actually visible. The other 92.5% of the ice is still under water! Back at the house on Duckworth Street Karl and I relaxed behind our computers. I asked Karl about it but Sherri is still his first love. "I got to know you through the Internet and I get to know so much more through the internet." He runs his own website on his own little server next to the computer table. Lights blink whenever somebody visits his site. I surprised him by changing the pop-up window of my side and have it redirect to his website. Karl was so amazed by the amount of visitors his site was suddenly having and was intrigued to see that one visitor on my website was using Arpanet. Computer nerds know that the Internet started off with Arpanet in the 70s. Can the prehistoric Arpanet-user identify himself to me by email? Karl and I are curious. Computer nerds (or more modern: internet addicts) have a few really good things in common. They love coffee and drink Pepsi and that can't go without a bag of crisps. So guess what we were doing this afternoon. I tried to update my website, edit photos and write reports, but when I am spoiled with crisps, Pepsi and a 100-megabits-per-second connection to the web, I become very lazy � honestly! I just surfed around the world from St John's. Sherri really had her day when she discovered how Karl and I were sending MSN messages to each other through the computer while we were sitting no more than 10 feet away from each other. When the evening started, Sherri had to go to her part-time job at Sobeys and Karl had to work until closing time behind the bar of Erin's Pub. "Here is $20," Karl said when he handed me the note. "I have to get to work, but with this you can get yourself something to eat out and a few drinks in town." How generous! A few hours later I decided to hit down town Water Street again and I visited Erin's pub again. I was introduced to some more steady visitors of this pub and I was honestly told that most of them are well-known musicians. There were the grey-bearded Dermot O'Reilly, accordion player Graham Wells, the owner Ralph O'Brien from Dublin, Chris Andrews and Mark Hiscock. Allison Bakker descents from The Netherlands when her 'opa' got across the water to Newfoundland after the WWII. She is regarded as part of the pub as she hangs around here almost every day. "I like this place and I can always have a drink, have a chat or play some cards. I always have a book with me, so you might also find me quietly reading a book at the bar." She comes across as a very social person tells me about the people at the pub, jobs she had and about her stay in South Korea, where she taught English. In the meantime I was sipping from another pint of Guinness, kindly provided by bartender slash host slash pub cleaner Karl. It was Tuesday night and that meant that one place in St John's was truly packed. 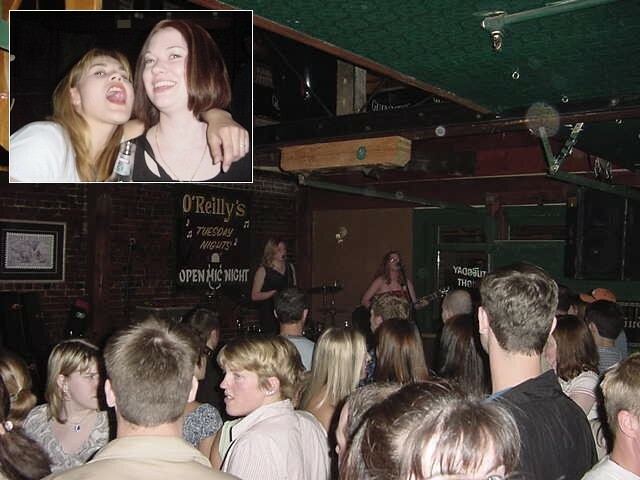 "At O'Reilly's Pub on George Street it is Open Mike Night on Tuesday's. Whoever wants to sing can sign up at the bar and play on stage." That sounded interesting to me as I kind of enjoy live music and after my Guinness I decided to have a walk down the road to George Street. George Street is the place with all the discoth�ques and music bars. It was not busy tonight, but in the summer this street comes alive during festivals where musicians are playing around almost everywhere on the street. In O'Reilly's I had a Canadian beer and had a look around for as far as I could. The place was almost packed. On stage a man was singing country songs, but I noticed not many people paid attention to him, except from a group of friends. Who else would cheer that exaggerated at this poor man? But the music got better, a few bands plugged in their instruments and played their three songs on stage and that kept the night refreshing. It was at the bar I bumped into two ladies who kindly introduced themselves as Laura and Jennifer. Laura was from Vancouver and Jennifer lives on The Rock. They told me their secret: "We play that we are lesbians to keep the boyz away from us, you know." I guessed by telling that secret to me, they didn't really wanted to get rid of me. While I was much more sober than they were, I hung around with them and a few friends of them and was finally pulled on that small dance floor when a really good band was allowed to keep on playing. I found out that Jennifer was a hair dresser in town and she offered to cut my hair. "Give me a call tomorrow and we'll find a spot," she said and she gave me the phone number of a saloon in town. I bet she'll find my bald spot there. It became a night that ended abruptly at 2 am, when the music was over and everybody hit the street. I guess I found this place too late! Disillusioned by the early closing of St John's I bit in a hot dog that was sold with my last 3 bucks at one of the many hot dog carts on George Street.